LIMA, Peru -- Canada was told in advance that the U.S., Britain and France were planning to launch airstrikes against Syria, Prime Minister Justin Trudeau said Saturday -- but was not asked to participate. "We were apprised in advance of the operation," Trudeau told reporters at the end of a three-day visit to Peru. "We were very supportive. And there was no request for Canada to join as part of that operation." The comments came as the international community was still grappling with the aftermath of the Friday's airstrikes against the Syrian government in retaliation for a suspected chemical-weapons attack that killed dozens of people. U.S. officials have said the strikes hit three chemical-weapons facilities, including one in Damascus and two in Homs. U.S. President Donald Trump hailed the attacks on Twitter as "perfectly executed," adding: "Mission Accomplished!" Syria has denied launching any chemical-weapons attacks, including one on April 7 in the rebel-held enclave of Douma that killed at least 43 people and injured hundreds more and was the catalyst for Friday's airstrikes. Russia, which has emerged as Syrian President Bashar Assad's strongest supporter, previously suggested Israel and Britain were behind the Douma attack and expressed outrage Saturday over the airstrikes. The U.S., Canada and their allies have largely dismissed Damascus's denials and said the strikes were necessary, but have not said how they know that the Syrian government was responsible for the chemical-weapon attacks. 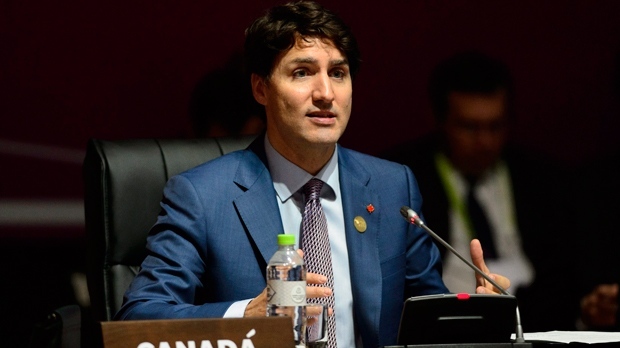 The joint airstrikes occurred as Trudeau was attending the Summit of the Americas, which brings together leaders from across the Western Hemisphere every four years, and which was largely overshadowed by the Syria crisis. Earlier in the day, U.S. Vice-President Mike Pence thanked Canada for backing the strikes and explicitly singled Trudeau out for praise during his address to summit participants. For his part, Trudeau described the airstrikes as "unfortunate, but necessary" to stop the Syrian government from launching further chemical-weapons attacks against civilians. "This is something we cannot accept, the use of chemical weapons on civilians," he said, "and the international community needs to continue to stand extremely strongly as we continue to hold Syria accountable." The prime minister also had some tough words for Russia, not only for its support to the Syrian government, but also its actions in Ukraine and the poisoning of a former Russian spy. Moscow has denied responsibility for the poisoning. "These are things that have demonstrated that Russia is not interested in being a positive actor in the global rules-based order and the rest of the international community needs to stand firmly united," Trudeau said.